Helen Sloan/HBOWe barely knew ye, Ray. Warning: Spoilers ahead for Game of Thrones season six episode seven. The Hound may have returned to “Game of Thrones” in season six episode seven, but he wasn’t the only character book readers were excited to see. Unfortunately, Ray’s time on the show was cut short after only one episode and he didn’t even make perhaps one of the greatest speeches in the entirety of George R. R. Martin’s series. 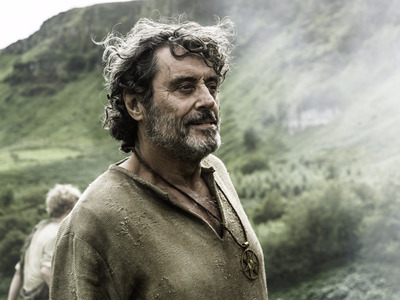 In the books, Septon Meribald is a priest for the Faith of the Seven who ministers to the small folk in villages around Westeros and comes into contact with Brienne and Podrick in the Riverlands. His speech about “broken men,” or wartime outlaws, discusses what happens to a person during times of war and poverty. Fans were pumped to see the monologue come to the screen, especially because the episode “The Broken Man” was named after the speech itself. And yet, he died before he had the chance to give it. 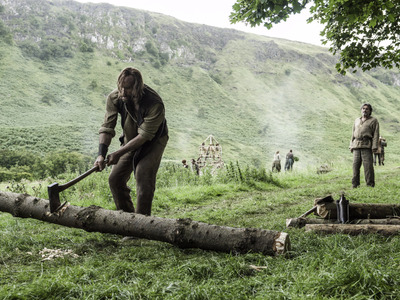 Helen Sloan/HBOBrother Ray watching the Hound cut some wood. Bryan Cogman, the writer of episode seven, as well as McShane both talked about how the speech was cut for unclear reasons. One can only wonder why it was cut. “There are many sorts of outlaws, just as there are many sorts of birds. A sandpiper and a sea eagle both have wings, but they are not the same. The singers love to sing of good men forced to go outside the law to fight some wicked lord, but most outlaws are more like this ravening Hound than they are the lightning lord. They are evil men, driven by greed, soured by malice, despising the gods and caring only for themselves. Broken men are more deserving of our pity, though they may be just as dangerous. Almost all are common-born, simple folk who had never been more than a mile from the house where they were born until the day some lord came round to take them off to war. Poorly shod and poorly clad, they march away beneath his banners, ofttimes with no better arms than a sickle or a sharpened hoe, or a maul they made themselves by lashing a stone to a stick with strips of hide. Brothers march with brothers, sons with fathers, friends with friends. They have heard the songs and stories, so they go off with eager hearts, dreaming of the wonders they will see, of the wealth and glory they will win. War seems a fine adventure, the greatest most of them will ever know. “For some, that one taste is enough to break them. Others go on for years, until they lose count of all the battles they have fought in, but even a man who has survived a hundred fights can break in his hundred-and-first. Brothers watch their brothers die, fathers lose their sons, friends see their friends trying to hold their entrails in after they have been gutted by an axe. “If they want new boots or a warmer cloak or maybe a rusted iron halfhelm, they need to take them from a corpse, and before long they are stealing from the living too, from the smallfolk whose lands they’re fighting in, men very like the men they used to be. They slaughter their sheep and steal their chickens, and from there it’s just a short step to carrying off their daughters too. And one day they look around and realise all their friends and kin are gone, that they are fighting beside strangers beneath a banner that they hardly recognise. They don’t know where they are or how to get back home and the lord they’re fighting for does not know their names, yet here he comes, shouting for them to form up, to make a line with their spears and scythes and sharpened hoes, to stand their ground. And the knights come down on them, faceless men clad all in steel, and the iron thunder of their charge seems to fill the world . . .